Following on from last week’s look at East Kent Goldings, our second hop of the week is: Bullion. Bullion is thought of as a new hop variety but it’s actually almost a hundred years old. It was developed back in 1919 at renowned agricultural school Wye College which was home to a pioneering hop breeding programme led by Professor Ernest Salmon – whose work influenced hop breeding and development throughout the world. A type of wild hop known as Manitoban was Bullion’s ‘parent’. (Hops are what is known as ‘diecious’ which means there are male and female plants. 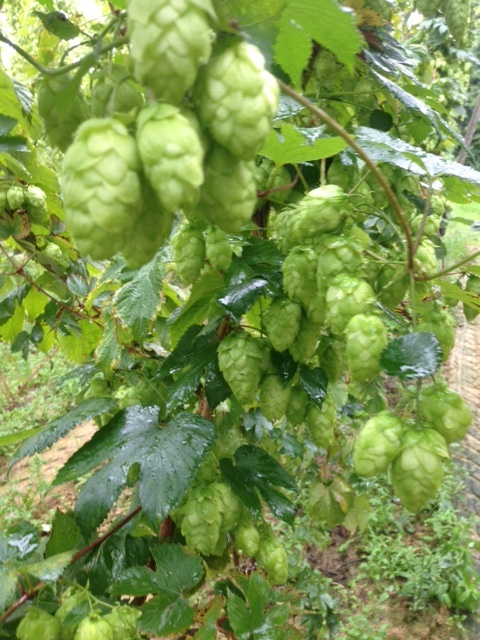 Female hops produce the cones used in brewing, while male plants are – as you might imagine – useful for breeding purposes!). The variety was created by crossing different male and and female plants through natural pollination as part of efforts to develop hops that were disease resistant. It would take some 30 years before Bullion was being grown commercially with much of the crop being used by Guinness. But come the 1960s there was something of a Bullion backlash as brewers began to complain the hop’s flavour was too strong, that it tasted American, and even that it was reminiscent of cat’s wee! Some spoke up for the hop though suggesting if it were boiled for longer the undesirable aroma would decrease and others bemoaned the way tastes had changed in the late 1940s with people now desiring milder flavours in food and less bitter beer – a fashion which poor old Bullion fell foul of. In the 21st Century beer drinker’s tastes have changed again and American hops are all the rage so it’s perhaps not a surprise that Bullion is making a comeback – with Tenterden-based Hukins Hops at the forefront of its return. (Look out for an interview with Ross Hukins which we’ll post during the Fortnight). Although it’s said to have both spicy and blackcurrant flavours and aromas it seems – as is the way with fresh/undried hops – to behave quite differently in green hop beer. Wantsum Brewery made a Bullion beer for last year’s Kent Green Hop Beer Fortnight, but rather than having a blackcurrant character it had a floral aroma and tasted like apricots and mandarin oranges – but it did pack a zingy, hoppy punch which some might describe as spicy. Kent Green Hop Fortnight begins at Canterbury Food & Drink Festival on Friday 25th Sept.
Bexley Brewery, Caveman Brewery and Wantsum Brewery are among those using Bullion in their green hop beers this year.